This is Crackers. Or Holly. Or Popcorn. She also answers to Jethro and I like to call her Cocoa Nibs. She'll answer to pretty much anything because she's pretty derpy. Crackers started out as my roommate's ex-roommate's cat, but the ex couldn't take care of her for awhile, so Crackers moved in with my roommate and eventually with me. She's a little bipolar and takes awhile to figure things out. She has freakishly little feet, even considering her small size, and she fancies herself a parkour champion. Really, she just likes to run around a lot and occasionally just topple of the side off the cat tree for no apparent reason. I sat down with Crackers in the living room and got her to agree to do an interview by poking her in the shoulder until she realized I was there and that it was rude to keep staring blankly at the wall. O.R.B: Good morning, Cocoa Nibs. I take it you're feeling saucy today. O.R.B: Yes, that is also your name. Now, shall we start the interview? O.R.B: You're enthusiastic, I like that. Okay. It's a well-known fact that you have often broken into the cabinets in search of snacks, jumping down and running off when caught. How do you answer allegations that you're a catnip addict? Crackers: The chair with the blanket on it is the most comfy. I like the shiny mouse the best. Sometimes I sit on the desk. O.R.B: Avoiding the subject, are we? Very well. We'll move on. You've become very fond of the kitty hammock hanging from the sliding glass door. We often find you curled up absorbing the sun's rays. What prompts you to scratch the big, orange chairs rather than one of the many scratching posts in the house? Crackers: There's grass outside. Don't touch my tail. O.R.B: Don't worry, you've made it very clear that you sometimes don't enjoy when your tail gets pet. You have yet to give a proper schedule for when it is okay to pet your tail and when you will respond to tail-pets with a swipe of your tiny, tiny paws, however. This brings me to my final question: Are the rumors true? Will you soon announce your candidacy for President? 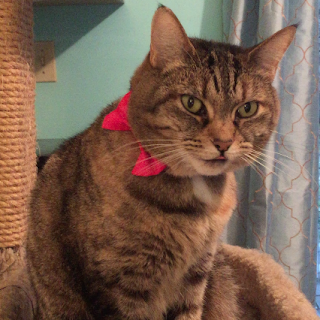 Crackers: I have a bow tie. The bathroom sink is very mysterious. I don't understand--[Crackers broke off mid-sentence and turned to stare, bewildered, at the microwave. Further attempts to attract her attention were ignored.